If there was any glimmer of hope that Mitsubishi’s long-standing series of Evolution high performance sedans would make a comeback, they have now been quashed after the Japanese carmaker’s chairman and CEO, Osamu Masuko stated that there are no solid plans for such a model in the near future. Speaking to Autocar UK, Masuko said the company is currently focused on developing its new hybrid SUV line-up, including an all-new ASX. The upcoming model was previewed by the Mitsubishi Concept XR-PHEV II that was shown in Geneva not too long ago. A new eX Concept will appear in Tokyo soon too. That certainly is bad news for the Mitsubishi Lancer Evolution (aka Lancer Evo, Lan Evo, or just Evo) nameplate that has been synonymous with the carmaker since the first iteration was introduced way back in 1992. The model finally bid farewell with a limited-number model known as the Mitsubishi Lancer Evolution Final Edition for both the Japanese and United States markets. However, Masuko has not dismissed that the Evo badge will be back, although it may appear on a high performance plug-in hybrid SUV instead. “If we can use EV or PHEV technologies for high-performance cars, we could certainly continue,” said Masuko. Mitsubishi did build a Pikes Peak racer dubbed the MiEV Evolution II in 2013 so they certainly do know a thing or two about using electrification for performance gains. Word is that the next-generation Mitsubishi ASX will gain an Evo version. What do you think of this – is it the right way forward for Mitsubishi, or a backward step for the brand? New Evo will return before 2020, because everyone know they won’t go wrong with sushi cars. True, by then, you can change your son saga to new evo. Call me a fanboy or whatever, the name Evolution should only be stick to Lancer only. And do not EV it! In US market. ..Evo were crushed by Mustang. Bring that Mustang to Malaysia and you will see a wiravo crushed it.. Yes a very sad news indeed. 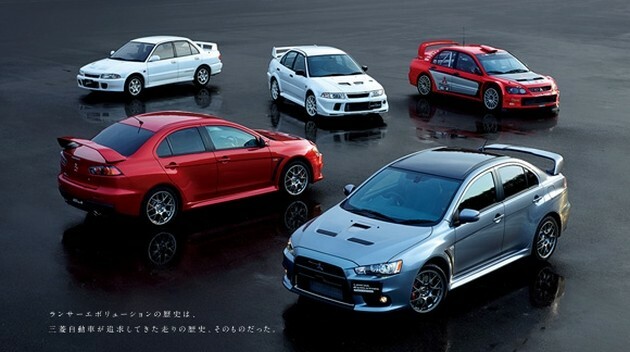 Any way to get a high res version of the main picture with all the EVO series? I wonder how Subaru will keep the WRX STI alive? But it seems like subaru is moving upmarket trying to fight audi. While next generation of wrx sti could be the key, Still manual or DCT? Still handbrake or EPB? Still EJs or DIT? 1litre go 5km is Seriously sorhai lah. Next Post: AD: Get up close and personal and test drive the all-new BMW X1 at Wearnes Autohaus (KL) this October!